Happy Wednesday which means time for a workout! Most people have one body part they love to work out and one they wish they could avoid. I despise legs. I hate my legs feeling like jell-o and the soreness trying to squat on the toilet after leg days. Abs on the other hand I could do all day, every day. There was a good year where I did an ab routine everyday. I love core exercises and love when I push myself even to be sore from an ab workout. 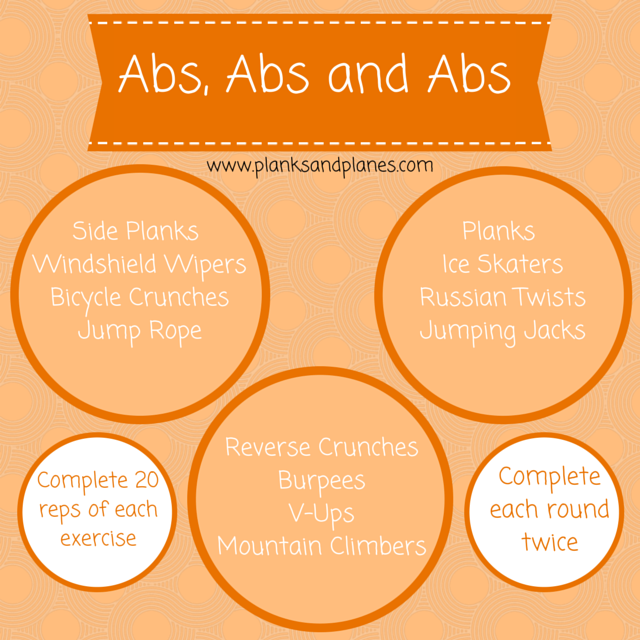 Unfortunately, abs are not just about crunches but a mix of core exercises with high intensity cardio. A request from bootcamp last week was to do a more focused class on abs. So here is your Abs, Abs and Abs workout. Enjoy your Workout Wednesday! Tell me in the comments- what is your favorite body part to work out or your favorite exercise? This entry was posted in Abs, Bootcamp, Fitness, Group Fitness, Health, Workout, Workouts and tagged Abs, Bootcamp, Fitness, Group Fitness, Health, Workout, Workouts. Bookmark the permalink.